Did Roundup Kill this Dog? SFDoE manages the Integrated Pest Management program, which decides which pesticides may be used on city property. It classifies the permitted pesticides into three tiers: Tier III is the Least Hazardous; Tier II is More Hazardous; and Tier I, Most Hazardous. It recently reclassified Roundup /Aquamaster (active ingredient glyphosate) as Tier I after the World Health Organization declared glyphosate a probable carcinogen. SFDoE is going to discuss some new rules restricting Tier I pesticides. We were hopeful, because we believe SFDoE does try to reduce pesticide use, and we thought the recent public outcry would strengthen their resolve to prohibit pesticides unless public health and safety were affected. For the record, and as our supporters already know: San Francisco Forest Alliance stands for No Pesticides in our Parks. So we were hopeful, in fact, until we read the draft rules. They contain truck-sized loopholes, and will not substantially reduce pesticide exposure for San Francisco’s park-using families, including small children and pets. Exception number 11 says that these herbicides may be used on “Invasive species posing a threat to species or ecosystems of value to the community.” Since that’s the entire justification that the SFRPD’s Natural Areas Program (NAP) gives is that it’s using these toxic herbicides on invasive species, they won’t need to change anything they do. What this means: NAP claims large areas of our parks as so-called “natural areas” – over 1000 acres in 32 parks. It includes most places people like to hike with kids and dogs like Mt Davidson, McLaren Park, Glen Canyon, Bernal Hill, and Pine Lake. They spray Tier I and Tier II herbicides on over 30 different species of plant. Some are close to the ground, like oxalis. Others are bushes, like blackberry, where they don’t stop spraying even in the fruiting season when everyone including kids are eating berries off the bushes. This video showing glyphosate and imazapyr being sprayed on blackberry was taken on Mt Davidson only a few weeks ago. Proposed rule number 4 prohibits use of Tier I pesticides on “the grounds of schools, preschools, or children’s playgrounds.” This is certainly an improvement, but it’s hardly enough. Playgrounds and preschools in particular are often inside parks, and if the parks can use these pesticides, then the children may well be exposed on their way into or out of the area, especially if they stop to hike or play in natural areas. Glen Canyon is an example – a preschool abuts the natural areas, which, as we noted above, gets a free pass. In McLaren Park, much of the park is a natural area, including areas close to playgrounds. (All the colored areas on the map below are claimed by NAP. Another permitted use is in landscape renovations (Exception 10). We presume this applies to such projects as Kezar Stadium and Marina Green, both of which used substantial quantities of Tier I herbicides. It requires the public to be excluded for 4 days after the spraying. However, there’s growing evidence that some of these pesticides are persistent for a lot longer than 4 days. Again, these are landscapes where our kids and pets play, often for hours at a time. Two other exceptions also increase risk of exposure: Tier I herbicides may be used on poison oak near paths, and on trees or weeds posing a public safety, public health or fire hazard. Since pretty much any shrubs or trees can be deemed a hazard, this again means that herbicides can be freely used. And as more trees are removed near paths and trails, poison oak thrives in the sunnier areas – and justifies more Tier I herbicides. the tree is to produce a vigorous re-growth of stump sprouts and suckers. The usual treatment of stumps is to paint the cut surface with a translocating herbicide, such as glyphosate or triclopyr. However this treatment kills the root system of the tree, killing the standing live stems of the tree. These present a hazard if they subsequently fall over. NAA is a synthetic plant hormone that suppresses re-growth of suckers without killing the roots. The exception was rejected, with this solution proposed instead – cut down the entire tree, not just the bits that are intruding into the right-of-way! And then paint the stumps with a Tier I herbicide (Roundup or Garlon), which will destroy the entire tree and, if other trees are nearby, potentially damage their roots as well. So instead of a solution that preserved the tree while limiting the damage, SFDoE approved a method that would be much worse. We also note that in recent months, SFRPD NAP staff have apparently been deployed to apply herbicide on SF PUC property. This suggests that SFPUC is also buying into the destructive NAP approach. Each year, SFDoE holds a hearing where they review changes to the list of approved pesticides, listen to the justifications for exceptions during the year, and take comments from the public. It’s usually held in a round table format in City Hall, with free discussion. This year, they will also discuss the new rules. With the recent outcry against pesticide use, they expect a much larger turnout and have changed the venue. Please be prepared with a comment of no more than 2-3 minutes long. 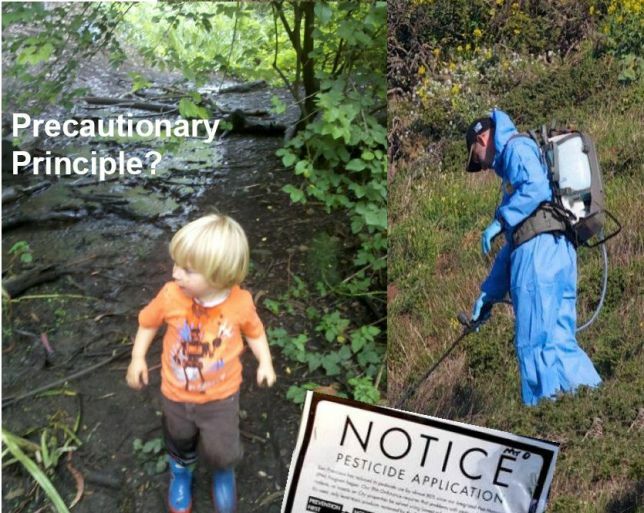 I would paraphrase SFDoE’s proposed pesticide policy as follows: “We won’t use pesticides EXCEPT wherever we want whenever we want.” San Francisco’s pesticide policy is dishonest and dangerous. Please come to the public hearing on December 16th and tell SFDoE what you think of their lousy policy.